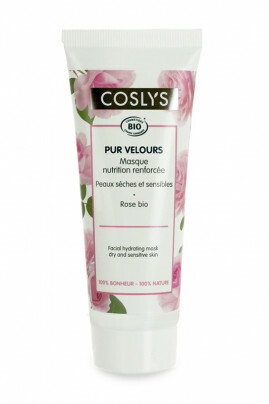 COSLYS Organic Rose Face Mask hydrates, rejuvenates and soothes dry and sensitve skins. Rich in soothing organic camomile flower water and nourrishing organic shea butter, this intense skincare leaves your skin smooth and supple. Apply Coslys Organic Moisturizing Face Mask in an even layer on your clean dry skin. Avoid the eye contour area. Leave it for 10 mn then swipe the excess using a clean tissue or cotton pad. Use twice a week. Aqua (water), glycerin (vegetal glycerin), spiraea ulmaria flower extract* (meadowsweet floral water), caprylic/capric triglyceride (emollient from coconut and vegetal glycerin), cetyl alcohol (emulsifier from coconut and vegetal glycerin), glyceryl stearate SE (emulsifier from coconut and palm-kernel), sorbitan oleate (vegetal emulsifier), butyrospermum parkii (shea) butter* (organic shea butter), anthemis nobilis flower water* (organic camomile floral water), persea gratissima (avocado) oil* (organic avocado oil), gossypium hirsutum (cotton) extract*, prunus armeniaca (apricot) kernel oil*, rosa damascena flower extract* (organic rose extract), laminaria ochroleuca extract (natural conditioning agent), aloe barbadensis leaf juice powder* (organic aloe vera extract), parfum (100% natural fragrance), bisabolol (active from candeia oil : brazilian tree), cera alba (beeswax), hydrogenated castor oil, glycine soja (soybean) oil (extrait de soja non OGM), tocopherol (natural vitamin E), benzyl alcohol (conservative), sodium stearoyl glutamate (natural emulsifier), xanthan gum (thickener), stearic acid (texturing agent), lactic acid (pH regulator), dehydroacetic acid (conservative), citric acid (pH regulator), linalool, limonene (components naturally present in the fragrance).